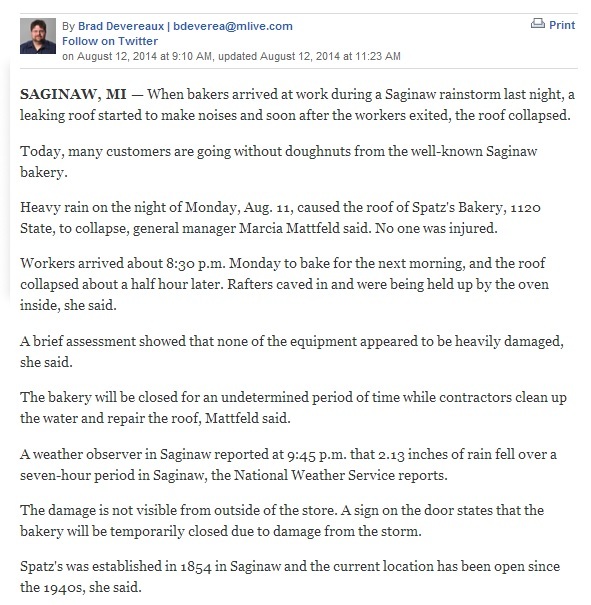 When it rained in Saginaw, Michigan that Monday night in August, 2014 it must have really poured because it brought the roof down on a local bakery, which is something an experienced roofing contractor in Menlo Park could have helped avoid. Although no one was injured, the damage to the small building’s interior was so severe that the bakery will be closed indefinitely. Public safety reporter Brad Devereaux discussed the details behind the mishap on MLive.com. Heavy rain on the night of Monday, Aug. 11, caused the roof of Spatz’s Bakery, 1120 State, to collapse, general manager Marcia Mattfeld said. No one was injured. The bakery will be closed for an undetermined period of time while contractors clean up the water and repair the roof, Mattfeld said. The building is home to Spatz’s Bakery, which has been around since the 1940s. None of the damage was visible form the bakery’s exterior. The combination of the structure’s age along with the weight of the heavy rainfall may have been what led to the roof’s demise. A weather observer in Saginaw reported at 9:45 p.m. that 2.13 inches of rain fell over a seven-hour period in Saginaw, the National Weather Service reports. A building that old without proper maintenance is an accident waiting to happen. In this case, the roof over Spatz’s Bakery was most likely sagging in some areas where rainwater was able to accumulate. Water damage and rot that amassed over time finally took its toll. It would be prudent for owners of buildings older than twenty years to have the roofs inspected on a regular basis for integrity issues. In California, residents and business owners alike have their structures’ roofs assessed for replacing or re-roofing by Menlo Park experts like Shelton Roofing, a company with more than seven decades of experience. This could spell the difference between keeping your roof over your head and it falling on your head.